Coconut Oil - 1,000 mg 120 softgels (Jarrow) - Penn Herb Co. Ltd.
Jarrow Formulas® Extra Virgin Organic Coconut Oil (Cocos nucifera) is expeller-pressed from the dried flesh (copra) of the coconut palm fruit, and does not utilize any chemical solvents in the manufacturing process. 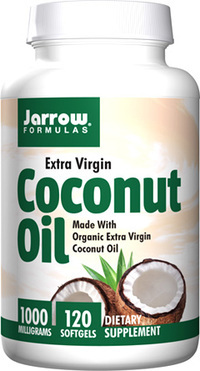 Coconut oil is a source of medium chain triglycerides (MCTs), such as lauric acid and caprylic acid. 100% expeller pressed, organic, extra virgin coconut oil. Softgel consists of gelatin, glycerin, purified water and carob (as a light barrier). No wheat, no gluten, no soybeans, no dairy, no egg, no fish/shellfish, no peanuts. Contains: Tree nuts (coconut).